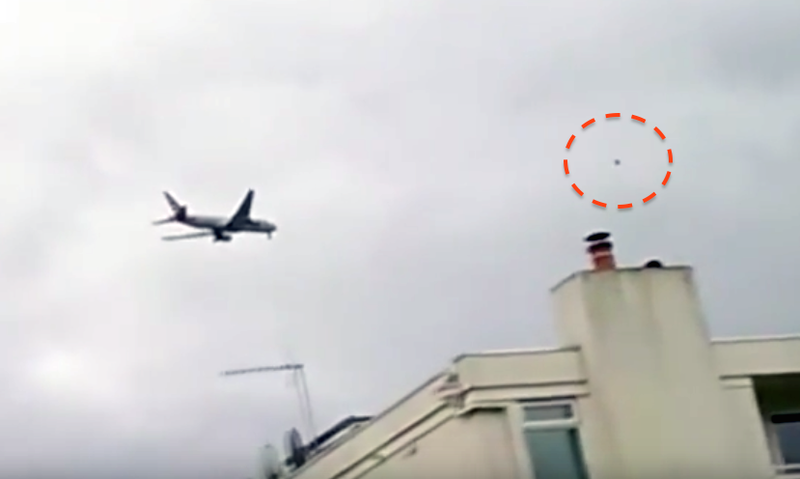 UFO SIGHTINGS DAILY: Black UFO Flying Over Airport London, Mar 26, 2016, Video, UFO Sighting News. Black UFO Flying Over Airport London, Mar 26, 2016, Video, UFO Sighting News. This UFO moves close to the jet as it approaches, but then keeps its distance, as if it changed its mind. The shape is that of a half circle and very dark. UFOs, some of which are alien drones, often monitor the air technology, since its the easiest to reach with few eyewitnesses. What I mean is, if you film 100 jets coming and going from an airport, you will film at least 1-5 UFO drones buzz past it. The object,which didnt seen to have any solid shape seemed to fly towards an airliner as it was landing about a mile or two from heathrow airport..it then seemed to change direction and fly away from the airport direction.There was no noise an it didnt seen to be going too fast..I thought it was strange that it was flying very close to the heathrow inbound flight path.